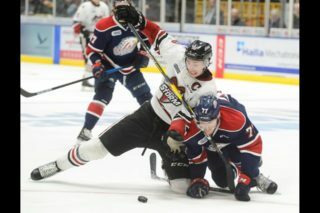 Sunday afternoon in front of a sold-out crowd, the Storm earned their eighth straight win on home ice skating to a 4-2 win over the Kingston Frontenacs. A high energy first period for both clubs as they exchanged several scoring chances in the early going. Just 98 seconds after the opening faceoff, the Frontenacs enjoyed a 1:26 two-man advantage that the Storm killed off. The game remained scoreless until Scott Kosmachuk took a Michael Latta feed and beat Franky Palazzese in the Kingston goal. Shots on goal in the first were 18-9 in favour of the home side. 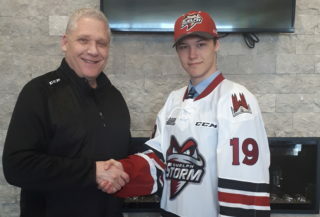 After opening the middle stanza with a powerplay, the Storm would go on a two-man advantage after Ethan Werek was whistled for hooking Peter Holland in the neutral zone. Guelph capitalized quickly as Tyler Carroll deflected a Taylor Beck shot over Palazzese to double the lead to 2-0. An Eric Gudbranson point shot cut the lead in half with the first of Kingston’s two powerplay goals on the afternoon. Before the end of the second, Tim Campbell restored the two goal bulge with another powerplay tally jumping on a rebound that Latta missed for his sixth of the year. Kingston continued to press early in the third and would eventually be rewarded when Ethan Werek fired a long shot off the rush that handcuffed Brandon Foote. 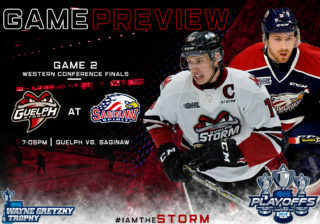 Tension built inside the Sleeman Centre as the Storm clung to their one-goal lead until Latta stepped around a Kingston defender inside the blueline and after Palazzese kicked out a long rebound, Tyler Carroll banged in his second of the game and 21st of the season for insurance. 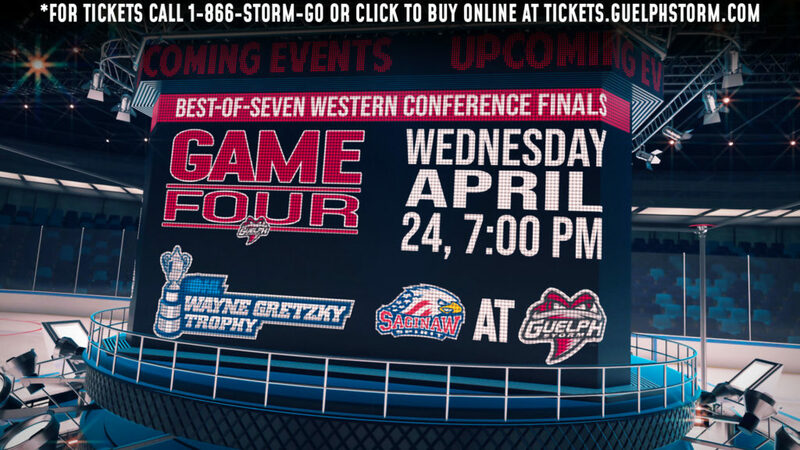 After travelling to Barrie to face the Colts on Thursday night, the Storm will look to make it nine in a row on home ice and gain some ground in the Western Conference standings when they host the Erie Otters on Friday, March 4th at 7:30 pm. 1st Period-1, Guelph, Kosmachuk 6 (Latta, Van Laren), 18:53. Penalties-Erlich Gue (too many men), 1:04; Lofquist Gue (delay of game), 1:38; Cajkovsky Kgn (hooking), 15:25; Brown Kgn (slashing), 19:33. 2nd Period-2, Guelph, Carroll 20 (Beck, Latta), 1:00 (PP). 3, Kingston, Gudbranson 10 (Doherty, Jones), 7:27 (PP). 4, Guelph, Campbell 6 (Beck, Erlich), 19:07 (PP). Penalties-Werek Kgn (hooking), 0:46; Moon Kgn (roughing), 4:27; Pereira Gue (hooking, roughing), 4:27; Van Laren Gue (roughing), 4:27; Pedan Gue (high sticking), 5:51; Harrison Kgn (hooking), 13:37; Doherty Kgn (delay of game), 15:11; Cajkovsky Kgn (tripping), 17:55; Mitchell Gue (hooking), 19:56. 3rd Period-5, Kingston, Werek 22 (Gudbranson, Brown), 6:54 (PP). 6, Guelph, Carroll 21 (Latta), 17:11. Penalties-Moon Kgn (roughing), 1:04; Gaskin Gue (roughing), 1:04; Werek Kgn (slashing), 2:01; Finn Gue (interference), 5:15. Shots on Goal-Kingston 9-12-10-31. Guelph 18-11-6-35. Power Play Opportunities-Kingston 2 / 6; Guelph 2 / 7. Goalies-Kingston, Palazzese 5-13-1-2 (35 shots-31 saves). Guelph, Foote 20-18-4-1 (31 shots-29 saves). Referees-Craig Spada (10), Kevin Blundell (6). Linesmen-Shawn Hamelin (88), Chris Thornton (89).